Home » Are You Ready to Get Certified? Are You Ready to Get Certified? If you are starting a career in Information Technology (IT) or new to the IT industry, start with CompTIA A+ page to know more about the first two exams to pass. If you want to make yourself more marketable in the IT field, go to the CompTIA Security+ page to know more about the Security+ certification exam. The Beyond the CompTIA Trio page can show you what’s next after your CompTIA A+, CompTIA Network+ and CompTIA Security+ certifications. For free resources, you can visit the Blog page to read blog posts that can help you Get Certified and Get Ahead. Looking for study materials to help you pass the certification the first time? Visit the premium site for available CompTIA A+, CompTIA Security+ or CASP quality online study materials. You may also check out this Study Resources page outlining the available materials for the following certifications: CompTIA Security+ or CompTIA A+. This Study Self-Assessment may help you determine if your study habits are setting you up for success with your next certification exam, such as the Security+ exam. Sign up to the Get Certified Get Ahead newsletter for tips and news about certifications to help people like you Get Certified and Get Ahead. 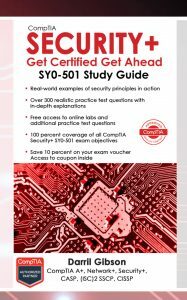 You will also get a free excerpt of the CompTIA Security+: Get Certified Get Ahead: SY0-501 Study Guide. This excerpt includes the introduction and Chapter 1.